The fire that caused a WestJet flight from Calgary to Vancouver to turn back was sparked by lithium-ion batteries for an e-cigarette, according to a TSB report. Lithium-ion batteries were the cause of a fire in the baggage compartment of a WestJet flight that had to make an emergency landing soon after taking off from Calgary last June, according to a Transportation Safety Board report. WestJet Flight 113 took off for Vancouver with 53 passengers on board just after 6:30 a.m. on June 14, 2018. It had reached an elevation of about 3,000 metres — 9,000 feet — when a fire warning light came on. Flight crew followed the cargo fire procedure, remotely discharging a fire extinguishing bottle in the cargo hold, then declaring a mayday and turning back to Calgary. The plane landed about 10 minutes later and was inspected by fire crews. "No visual signs of fire were noted, and no hot spots were detected by infrared camera imaging," reads the TSB report. Passengers and crew members were removed from the plane before the cargo doors were opened. 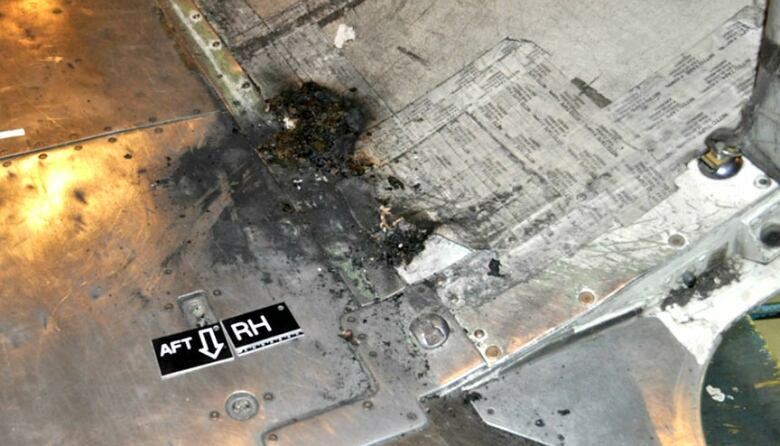 When the cargo doors were opened, a bag was found, face down, showing signs of fire damage. Fire damage was also found near the bag on the fire-resistant liner of the cargo compartment. "The fire did not penetrate the cargo liner or aluminum floor structure and was contained to an area of approximately 24 inches by 24 inches," reads the report. "The burnt bag was offloaded and segregated, and then all other passenger baggage were offloaded." The cockpit voice recorder and flight data recorder were sent to a lab in Ottawa, which showed that other than the indicator light, crew members had no other warnings or alarms. 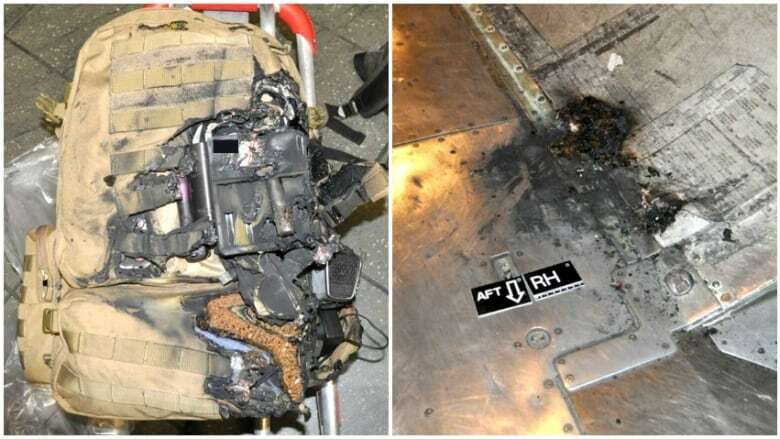 The passenger whose bag caught fire flew frequently for business purposes, according to the report, and was aware of WestJet's policy against putting lithium-ion in checked luggage. 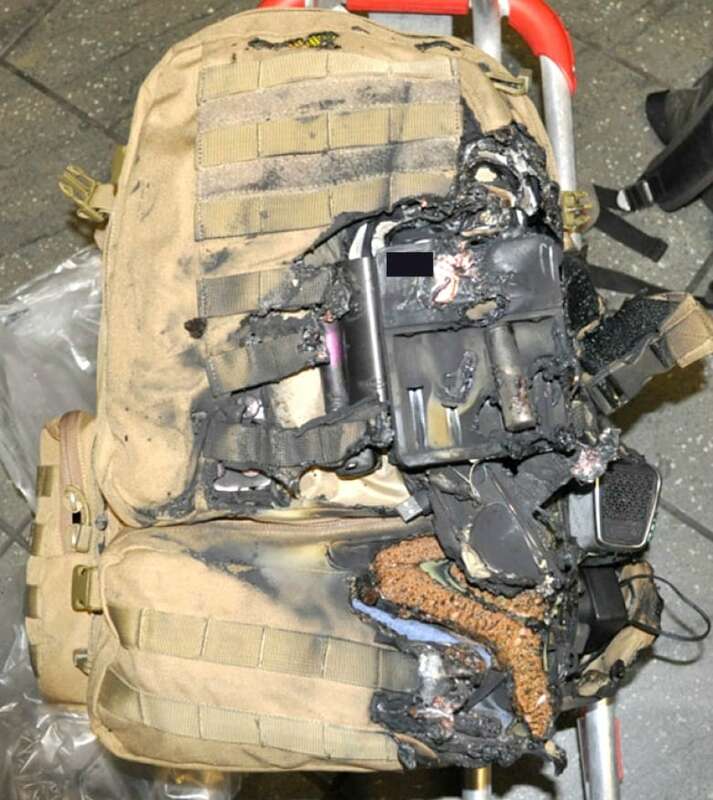 "The passenger ... inadvertently packed two spare lithium-ion batteries for his e-cigarette ... in the front pocket of the bag. The pocket also contained a dry herb vaporizer, a portable speaker, and USB cables," reads the report. "The passenger arrived at the airport and checked his bag in. He took his e-cigarette and two other lithium-ion batteries into the passenger cabin, as required by WestJet's policy on e-cigarettes.